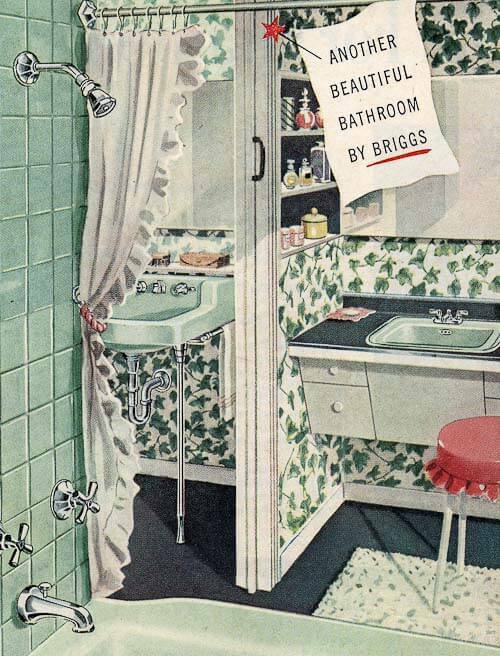 I have never seen this floor tile pattern idea before, and I love it: In Laura’s 1947 midcentury modest house includes this original bathroom with 4″ octagon-and-dot floor tiles that are also used as the bottom row of wall tiles to create a very pleasing “scalloped” edge look. How very clever — and back in the day, when octagon and dot tile was more widely available in lots of colors, it would have been a very cheap and cheerful design idea. We still have a few places to find tiles like this, if you want to recreate this look. Continue on for a close-up of the design — and my resources to find octagon-and-dot tiles today. 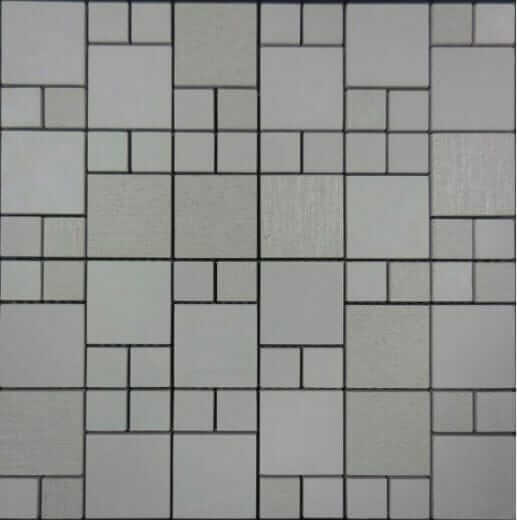 To create this bathroom tile design, you will have to find octagon tile in a real color (see my resource list below), add a “dot” in a lighter color… and then repeat the color in the dot up the walls in 4″ square tiles. You could do this, really, with any two complementary colors of tile; however, I think there is something particularly pleasing about the dark-floor-light-wall combo that makes the scallops work. 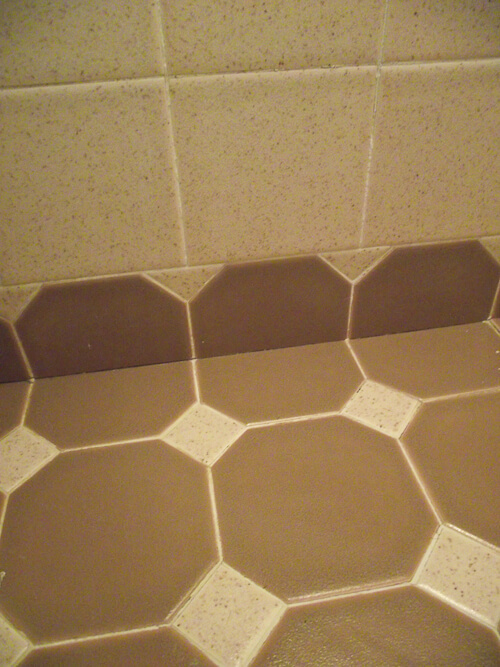 The tile in the bathroom is what we’ve called “oatmeal” due to the flecks that are in the lighter-colored tile, and “mocha” since the brown is the color of chocolate milk. Thank you, Laura, for providing these photos (readers should know that I tortured her to get the angles I wanted) — you did a great job. I think the colors are just lovely. 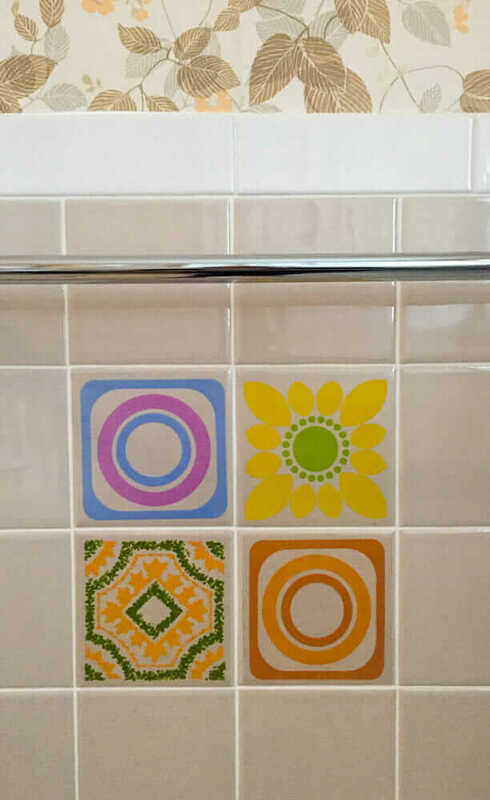 Universal Ceramic’s Brittany collection includes a variety of colors in octagons, squares and dots. 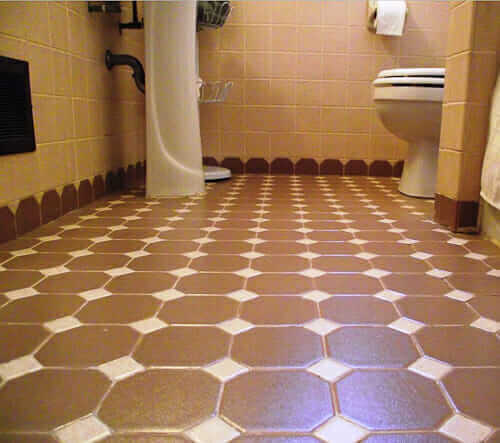 I had a reader email me that they had recently done a bathroom using Universal Ceramic tiles… hmmm, I need to go look. If you have landed on this page looking for plain ole octagon and dot floor tile in black-and-white or white-on-white, get thee to a Home Depot or Lowes. 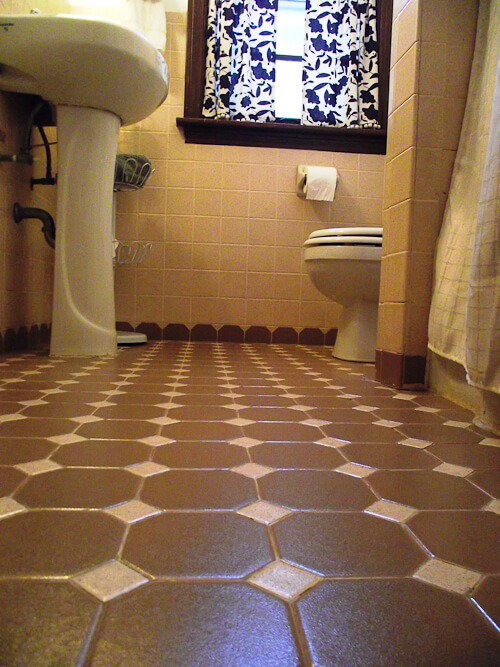 Jamie’s custom-design Daltile mosaic bathroom floor — and Hall-Mack Relaxation Unit and recessed scale, too! 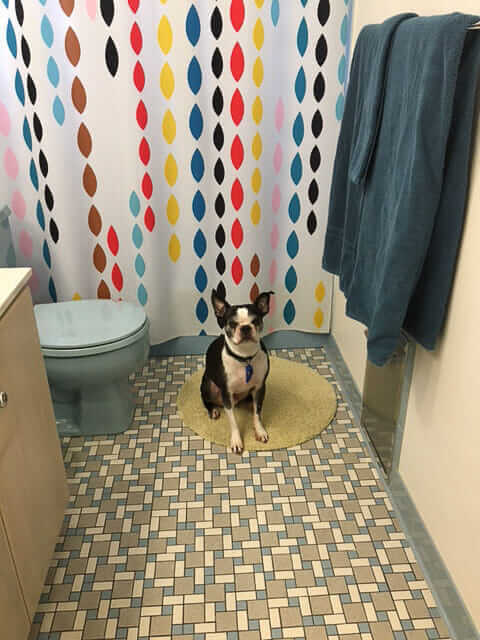 I get to plan my parents bathroom! They live in a 1930’s house so i’m going to use white and blue tiles in that pattern. I think it will look really nice?